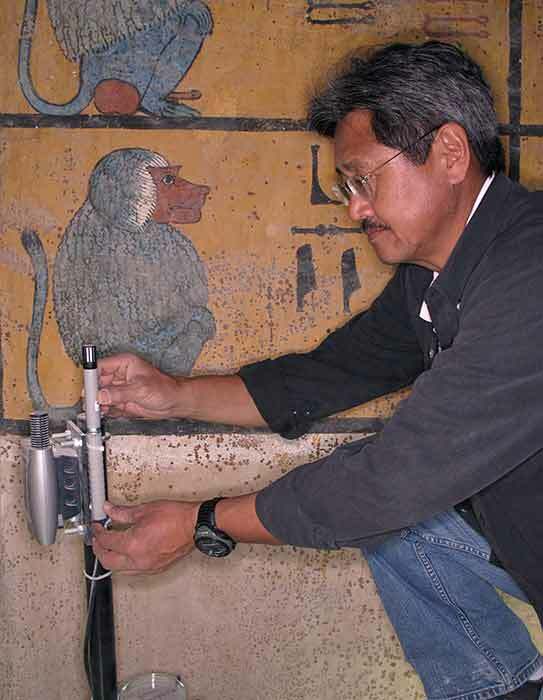 In-situ instrumental analysis: Non-contact, non-invasive examination techniques such as technical imaging, portable X-ray diffraction (XRD), portable X-ray fluorescence (XRF), and work with a handheld microscope to study the wall paintings, sarcophagus, and outermost coffin. Ex-situ instrumental analysis of samples: A limited number of samples were approved by the SCA for analysis at the GCI. Therefore, sampling areas were selected carefully, building upon information from in-situ visual examination and noninvasive study of the paintings. The main focus of the sampling was to look more in depth at causes of deterioration in order to develop the conservation plan. Analysis was undertaken at the GCI using cross-sections, Raman microspectroscopy, X-ray diffraction (XRD), gas chromatography with mass spectrometry (GC/MS), pyrolysis-gas chromatography/mass spectrometry (Py-GC/MS), Fourier-transform infrared microspectroscopy (FTIR), environmental scanning electron microscopy with energy dispersive X-ray spectroscopy (ESEM-EDX), and enzyme-linked immunosorbent assay (ELISA). Microbiological investigation: Already present on the paintings when Carter entered the burial chamber in 1923, the brown spots have been the subject of numerous investigations and treatment interventions. However, no proof has ever been presented that they are biologically active. Investigation of the brown spots was therefore an important component of the current SCA-GCI project and in particular to determine whether they pose a continuing risk to the paintings. Methods utilized include photographic monitoring, culturing of swabs, DNA analysis using polymerase chain reaction (PCR), chemical analysis and microscopy. The preliminary findings have for the first time confirmed that the spots, microbiological in origin, are no longer viable. Environmental monitoring: Environmental monitoring is being undertaken to assess the effects of exterior conditions and visitation on the microclimate within the tomb. Parameters monitored in the tomb include relative humidity, temperature, particulate matter, carbon dioxide, and rates of air exchange. Geotechnical investigation of the stability of KV 62. Hydrological study of flood risks to the tomb and methods of prevention. Literature research: For all investigations, background research was conducted in order to place the project findings within the wider context of existing knowledge in these areas of study. A report on the scientific investigation of the tomb wall paintings was completed in 2012. This report contributed to the development of a detailed conservation proposal during the second phase of the project.